you can do that. its already built-in just not used on the default template. in the acp i see the 5 level, but i have error when save the settings LOL. there are another files to edit? How can I put this extension to accept values of 9.99 instead of 10? I FOUND THE SOLUTION TO THE PROBLEM BELOW. What is the proper way to get a link to the membership purchasing page without using club mode? I found that going to mywebsite.com/bbmemberships/index.html will bring up the page, but there is an error message. Is this the right way to get to the membership purchasing page? I checked the phpbb error logs and there were no errors related to this. Is it possible to setup enable recurring payments in paypal? No, it's not possible. The only easy way is to create a recurring button within PayPal and add the html code on the extension page somewhere. But that way it would not have the extra features as auto group for example. It would be great if it had that. I never seen a recurring payment system in phpbb, ever. Leinad4Mind » Yesterday, 8:44 pm wrote: No, it's not possible. The only easy way is to create a recurring button within PayPal and add the html code on the extension page somewhere. But that way it would not have the extra features as auto group for example. 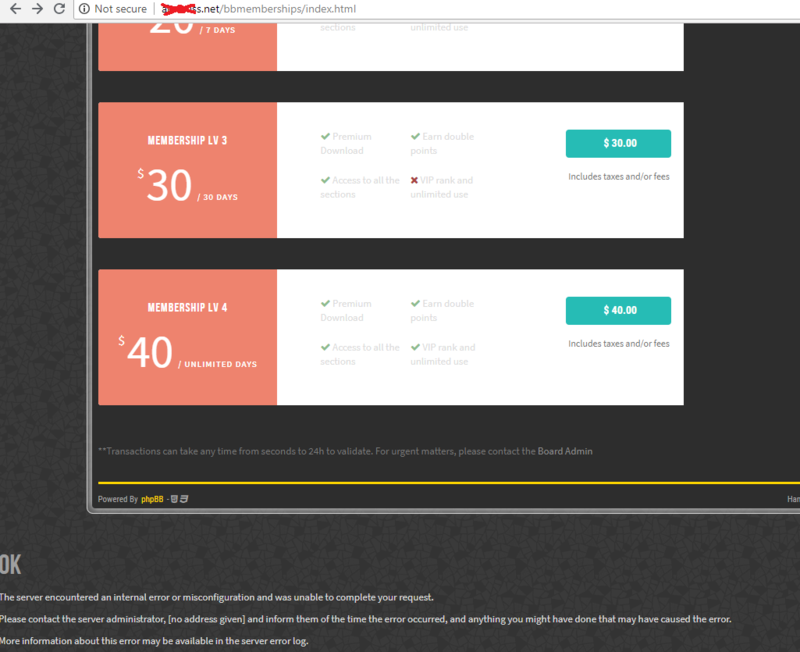 So, can you please explain how this plugin works if say, I set the expiration date 30 days. The user will see his membership is expiring and need to pay again, right? What if he pays before it expired? will the remaining days be ignored? Thanks a lot for responding to my queries.